Yesterday we had some friends over for Christmas dinner. Last year our families started the tradition of celebrating Christmas together with a potluck style dinner. 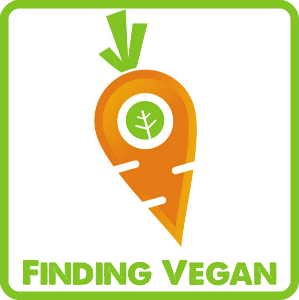 We are all vegetarians and therefore the food was not especially traditional, plus we are all born and raised in different countries which makes the blend of courses very interesting. When our guests arrived we served a small snack and a warm beverage. In Sweden we have the tradition of drinking “glögg” around Christmas. Traditionally it is made of wine and various spices and is served warm together with raisins and almonds. Today there are many different versions of glögg in the market, some with alcohol and some without. My favourite glögg is made of fresh apple juice or “äpplemust” (which I haven’t been able to find any translation for in English) and cinnamon. It is free from alcohol and for everyone to enjoy. With the glögg I served beetroot crisps made from Swedish, organic beetroot. Apple and beetroot is a great match and if you use Swedish winter apples for your juice you also get the pleasure of serving seasonal food which is very nice and sometimes a bit tricky during the Swedish winter. 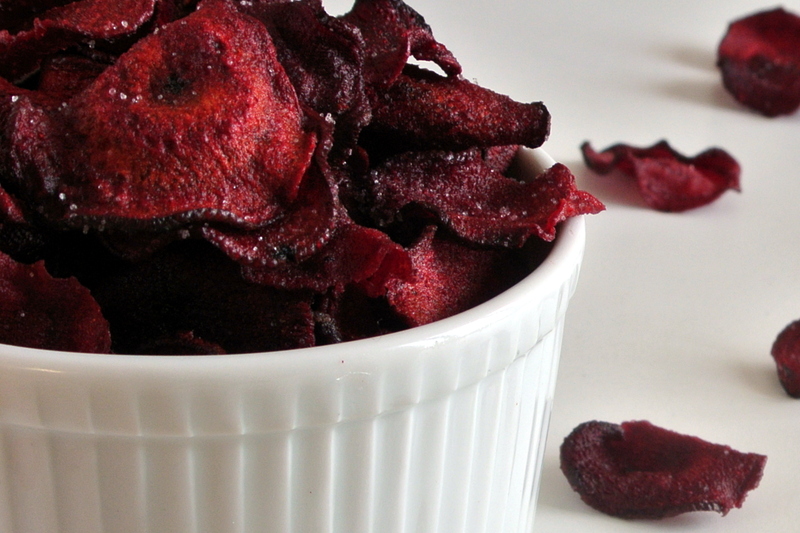 Making your own crisps is very easy and at least as tasty as the ones you buy. 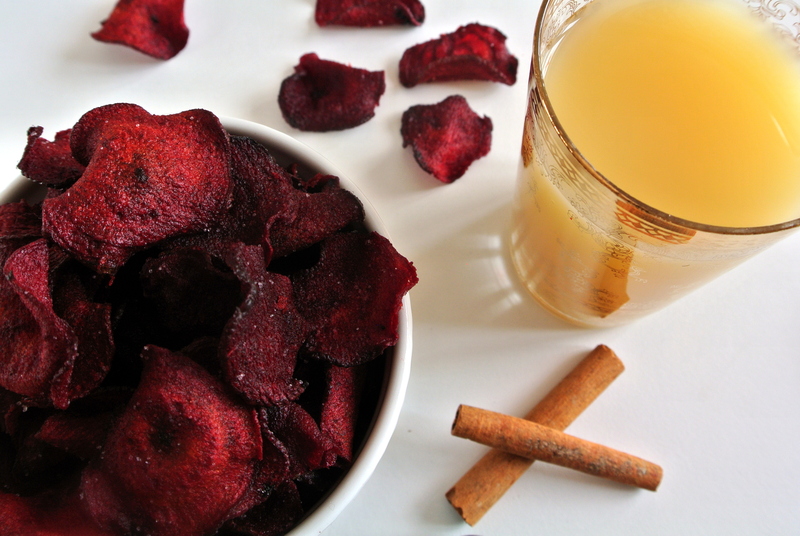 Buying crisps made of root vegetables is expensive and sometimes hard to find which gives you a good reason for making your own. For the recipe below you can use any type of root veggie. I also enjoy crisps made of parsnip and Jerusalem artichoke. Pour the apple juice or äpplemust in a saucepan. Add one or two cinnamon sticks. If you want a mild cinnamon flavour you only add one cinnamon stick. If you want a more intense flavour, you add two. Slowly heat it to boiling, lower the temperature and let it simmer for 5-10 minutes. Pour it up in small glasses or cups (think of the size of an espresso cup). If you like, you can add a cinnamon stick inside the cup which can be used for stirring but it is also a nice decoration. Slice the beetroot into thin slices, about 1-2 mm. Use a mandoline vegetable slicer or a food processor for this procedure since the slices need to be equally thick all over. Heat the oil to between 140-150°C / 285-300°F. For a better result you can check the temperature with a cooking thermometer. If the heat is to low, the crisps will become a bit soft and if it is to high they will burn. Fry them in batches and leave them draining on a piece of paper towel. When the crisps stops fizzling or fizzles a lot less, you will know they are done. 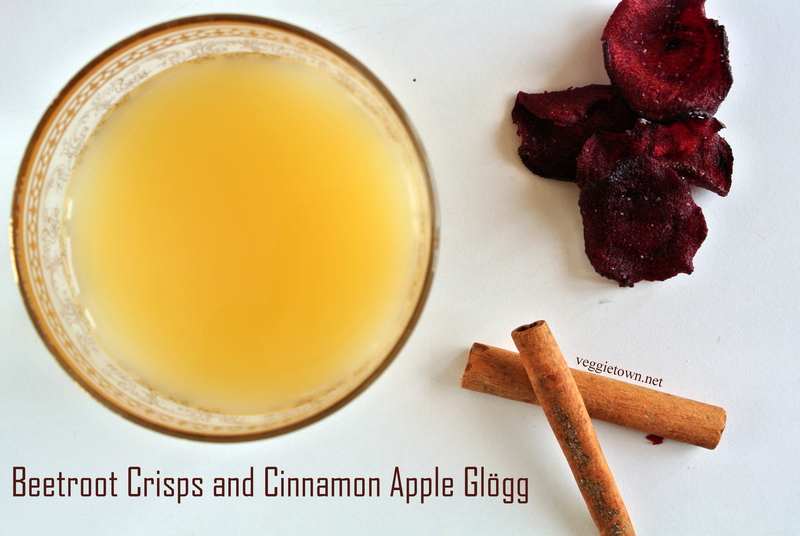 Season with salt and enjoy together with a glass of apple glögg! This entry was posted in Juices and Smoothies, Sweets and Snacks. Bookmark the permalink.